President Trump issues Holocaust Remembrance Day proclamation, saying Americans are 'obligated' to combat anti-Semitism. 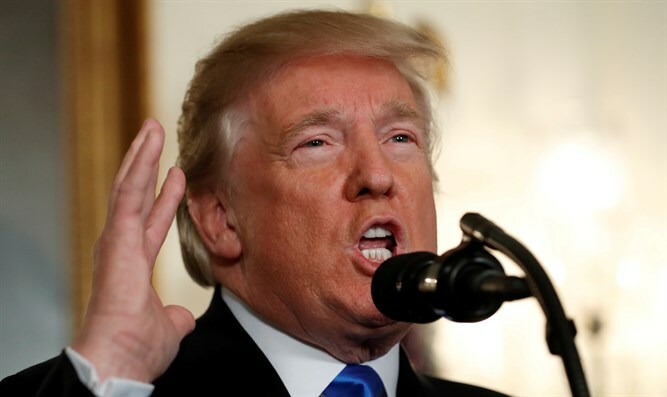 Americans have “a moral obligation to combat anti-Semitism, confront hate, and prevent genocide,” President Donald Trump said in a proclamation issued for Yom Hashoah, Israel’s Holocaust Remembrance Day. The proclamation issued on Wednesday recognizes the “Days of Remembrance of Victims of the Holocaust 2018” to be observed from April 12 to 18. The proclamation also notes that this year marks the 75th anniversary of the Warsaw Ghetto Uprising. Yom Hashoah lasts for 24 hours in Israel and began on Wednesday night. “Although spearheaded by one individual, this undertaking could not have happened without the participation of many others who recruited, persuaded, and coerced in their efforts to incite the worst of human nature and carry out the ugliest of depravity. The abject brutality of the Nazi regime, coupled with the failure of Western leaders to confront the Nazis early on, created an environment that encouraged and enflamed anti-Semitic sentiment and drove people to engage in depraved, dehumanizing conduct,” the proclamation states. In addition to noting that six million Jewish men women and children were killed in the Holocaust, the proclamation states that millions of other Europeans were murdered by the Nazi regime including Roma and Sinti Gypsies, mentally ill and physically deformed individuals, Slavs and other minorities, Christians, Jehovah’s Witnesses, gays, and political dissidents. “We must ensure that the history of the Holocaust remains forever relevant and that no people suffer these tragedies ever again,” the proclamation said.